Two recent articles, one by a librarian and one by a publisher, talk of the growing realization on the part of both parties that they increasingly have common interests, as both learn how to deal with the the implications of electronic publishing — Librarian Barbara Fister’s Library Journal cover story Publishers & Librarians: Two cultures one goal and publisher Neil Schlager’s blog article The problem with reference publishing. In her own category: Kassia Krozier (@booksquare) – Not a librarian or a publisher, but in the center of the discussion! Tim O’Reilly (@timoreilly) and his group at O’Reilly Publishing have created a unique gathering place for thinking about the future of publishing. The O’Reilly Radar blog has articles by Tim and a group of other writers, some with library connections, notably Peter Brantley (@naypinya). In addition, the annual O’Reilly Tools of Change for Publishing Conference (TOC) in New York has speakers from the library world as well as the publishing world. Writers and speakers for the O’Reilly blog and TOC conference appear regularly on @timoreilly‘s Twitter tweets. Also, during the TOC conference, on-site Twitter reports are extensive. Joe Wikert (@jwikert), from the list above, also works at O’Reilly. 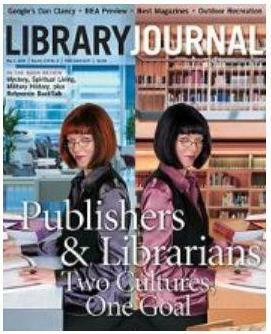 To read Seeing the Picture articles about issues of libraries and publishing, see the categories Publishing and TOC. Articles that have had comments/discussions with publishing people: Copyright in Google Books: Pictures & Text and Jon Orwant on Google Book Search at TOC. Posted in Libraries, PicsYes, Publishing, TOC, Twitter, Uncategorized. The slides and data from Jon Orwant’s presentation on Google Book Search at TOC, that were not available when I wrote previously, have now been put up on the O’Reilly site. [these have been removed, see comment below] This is made up of 59 PDF slides, covering a range of recent developments with Google Books, including the recent release of GBS mobile, and a discussion of the Oct 2008 Publisher settlement. The part I’m most interested in is the data on GBS usage that had been mentioned by Orwant in various venues before, but with few details. The details in the TOC presentation are mostly in three “Case studies” of publishers that participate in the GBS Partner Plan — McGraw-Hill, Oxford University Press, and Springer. I’ve chosen one slide for each of these publishers that show various long-tail effects for usage of their books that are in GBS, and one slide that has data for a more extensive grouping from GBS. McGraw-Hill case study is presented in slides 21-23. Below is slide 24. 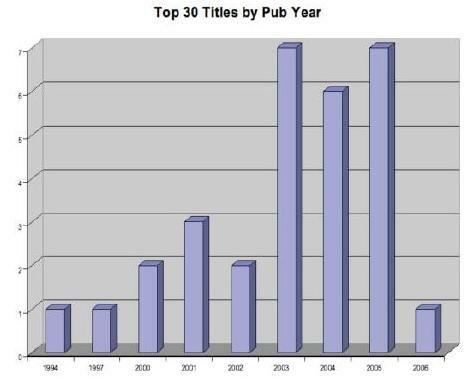 Note that this is a small sample of only the top 30 titles. Oxford University Press – Slides 26-31. Below is slide 27. Note the long tail of visits for pre-1990 books. Springer – Slides 32-36. Below is slide 35, showing clicks for Buy this Book. 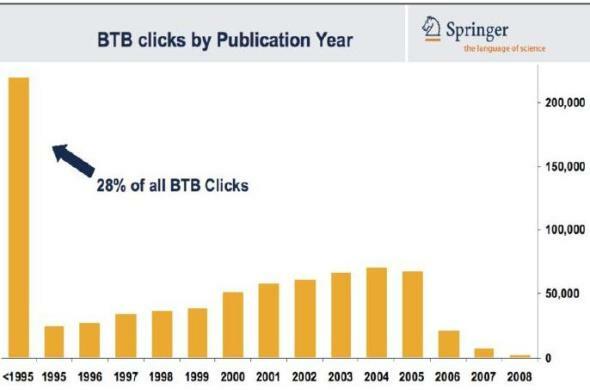 Note again the very long tail of clicks for pre-1995 books. 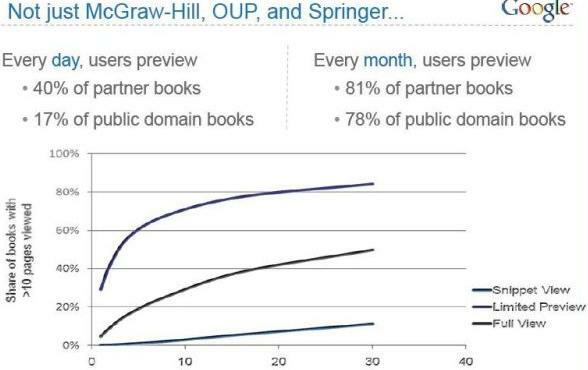 Slide 37 below shows “Share of books with more than 10 pages viewed”, apparently for all books in GBS. The coloring of the data lines looks ambiguous to me – The lowest line is undoubtedly for Snippet View books. It looks like the top line is for Limited Preview, which are presumably higher than Full View books, apparently the middle line, because Limited Preview books are more current. Posted in Google Book Search, Long Tail, PicsYes, Publishing, TOC, Uncategorized. Jon Orwant, from Google Book Search, made a presentation at the O’Reilly Tools Of Change (TOC) for Publishing Conference in New York last week, which I did not attend. Apparently Orwant presented some numeric data about the use of Google Books, but the data has yet to be spread to the world (See my comment on Peter Brantley’s blog about this). I’ve been searching in the week since TOC, to see what discussion there is of Orwant’s talk, and have found little. So I’m excerpting the three pieces that I have found. Only the first has any numeric data at all. Conversion rates from Google Book Search results have been great for their partner publishers, mostly in the Textbook, Reference and STM channels, particularly in the shallow backlist (2003-2005 pubdates) with the highest Buy the Book clickthrus on 2004 titles. For some publishers, conversion to buy is as high as 89% for the titles they have made available. 30% of viewers looked at 10 or more pages when viewing the content of the book to make a buy decision. The future is analytics! Google is thinking about what data they can pull out of their logs and provide anonymous aggregate data around consumer behaviour like what books were purchased that were like this one, search terms used most often for a category, most effective discounts, most effective referral sites etc. Jon Orwant, from Google Book Search, stated at TOC that ‘the ultimate goal of Google Book Search is to convert images to “original intent” XML’. He explained the post-processing Google runs to continuously improve the quality of the scanned books, and to convert images to structured content. Retro-injecting structure accurately is no mean feat but when it’s done, Google will be able to transform the books into a variety of formats. The content becomes mutable and transportable, in a sense it isn’t yet, even though it is scanned, online and searchable. Orwant also presented three case studies – McGraw Hill, OUP, Springer – that demonstrated the benefits publishers can gain from having their books in GBS. Highlighting the theme of discovery (to my mind), Tim O’Reilly interjected, at the end of these case studies, and made the point that O’Reilly used to own the top links to their own books in Google search results, but have now lost those links to GBS. Orwant, somewhat simplistically, responded that O’Reilly needed to improve their website to regain the top ranked link per title, as this spot was determined by Google’s search algorithms. This was not a convincing response, and dodged the issue, which I understood to be that the scale and in-house-ness of GBS could seriously inhibit the ability of the publisher to represent their own products online at the most common point of entry by the consumer, Google search results. There are many compelling reasons for publishers to own the top search result link, the most obvious being: offer unique additional content around the title, start a conversation with the reader, control the brand. There are 1.5 million free books, all public domain titles, available on Google. But if you want to access them, well, you’ll have to go to Google. Or you’ll have to have Google generate results at your site. Because the Google team are specialists in latency. They can do things with milliseconds that you couldn’t work out in your dreams. That snippet view you see with some titles? Orwant‘s official position, pressed by Cory Doctorow, is that it’s fair use. But once the October 2008 settlement in Authors Guild v. Google is approved by the court, you’re going to see that snippet view jump to 20% of the book. Posted in Google Book Search, PicsNo, Publishing, TOC, Uncategorized. it was great to see google is serving digital text, rather than scans, since text is a lot more nimble. however, a tap on a paragraph brings up the scan of that paragraph, which is nice. and another tap restores the text. so if you want to verify the o.c.r., it’s simple to do. as i said above, this is nicely done. I’ve bolded what I take to be the most interesting point here, that Google has done an extra-special job of OCR’ing text for GBS mobile. As bowerbird notes, hopefully Google will share more about this process, sooner or later. Posted in Google Book Search, iPhone/iPod Touch, PicsNo, TOC, Uncategorized.